One Work is a series of exhibitions that responds to the possibilities of Mercer Union’s new location. We will be exhibiting individual artworks in the various spaces outside of our two formal galleries. These spaces include the stairwell, the windows and the foyer area. The exhibition schedule will rotate on a monthly basis. 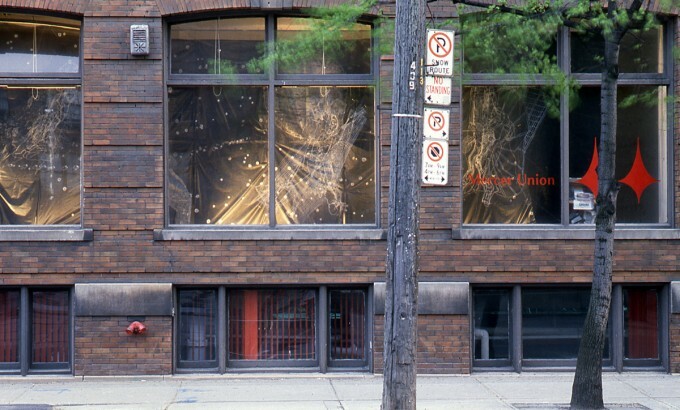 Richard Sewell‘s Space Opera (1995) is composed of a walk-through, illuminated installation/diorama in Mercer Union’s Resource Centre and Archives, which may be be viewed, night and day, in our King Street windows. The diorama contains models of satellites, moons, planets, and a comet–caught in a manufactured night that recounts the story of a comet’s collision with Jupiter. The satellites reflect combinations of the three mythical archetypes– Satellite Man, Bird Man and Committeewomen–that make up Sewell’s personal cosmology. Within the installation are elements that refer to scientific visions of evolution: dimensional models of arthropods, trilobites, and life forms recently found in British Columbia’s Burgess Shale, as well as rubbings based on illustrations in human anatomical manuals and bird identification guides. The artist’s materials provide a nocturnal palette of white, grey, black, and shiny bits; they include styrofoam, tulle, plastic utility netting, tissue paper, plastic tablecloths, reflective mylar tape, and silicone sealer. Sewell’s do-it-yourself technology accounts for the intuitive and poetic elements that are often not evident in the scientific models with which we are most familiar. Richard Sewell is a Toronto artist whose works have long reflected his researches into how printed and drawn images might evoke three-dimensional space. In 1970, he helped to found Toronto’s artist-run printmaking facility, Open Studio. He continued to be involved in Open Studio’s administration until 1982. 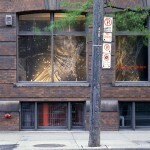 Since 1983, he has been a studio instructor at the University of Toronto. Sewell’s work has been exhibited in Canada and internationally, and will be featured in a solo exhibition at the Station Gallery in Whitby this November.